A one-off jab for eczema sufferers can halve itchiness for months at a time, a study has found. Follow this link to read the whole story on The Times web-site. Read more about eczema on our Skin Conditions page – here. 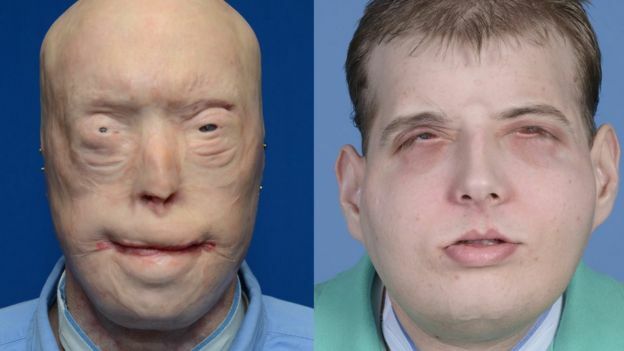 US surgeons say they have carried out the world’s most extensive face transplant to date, including the entire scalp, ears and eyelids. Follow the BBC link to read and hear the whole story. As a study reveals that young people with skin conditions find their mental health suffers, BBC Breakfast talks to one young woman who struggled to cope with acne. Follow the BBC link above to listen to her story. Was it racist when some white fans of the model Winnie Harlow painted their skin to look like they too had Vitiligo?Follow the BBC link above to read the whole story. There is huge confusion over the labels on sun creams, and manufacturers should all use the same rating system, says the Royal Pharmaceutical Society. Follow the BBC link above to read the whole story. Cancer drug combination ‘shrinks 60% of melanomas’A pair of cancer drugs can shrink tumours in nearly 60% of people with advanced melanoma, a trial suggests.Follow this BBC link to read the whole story about how research suggests these drugs can have an effect on the 6th most common cancer.